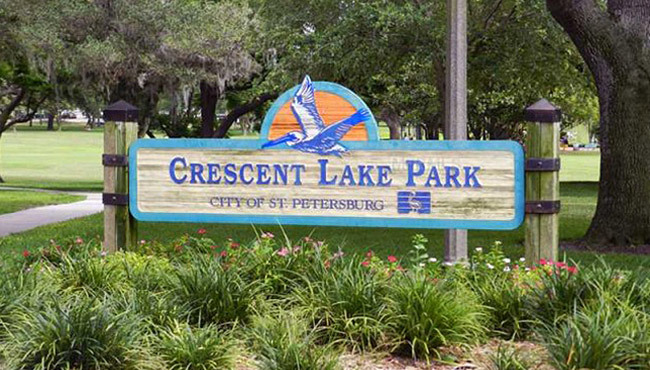 Crescent Lake lies at the center of our neighborhood, surrounded by a manicured 56-acre public park. East of the lake is the “Great Banyan Tree”, a living “jungle gym” for generations of our children. It is featured on the neighborhood logo. To the south is Huggins-Stengel Field, once Spring Training home for the New York Yankees and now serving the Tampa Bay Devil Rays organization. Further south still is the neighborhood’s most visible landmark, a 1923 water tower, recently repainted as a giant salt water aquarium by local muralist, Tom Stovall. East and west of the park, our residential streets, some with brick paving and hex-block sidewalks, slumber beneath stately trees. Nearly every street has a view of the lake. Beyond the residential sections lie busy 4th and 9th (Dr. M. L. King) Streets North. New businesses along these streets are rapidly transforming our area into an antique shopper’s Mecca. 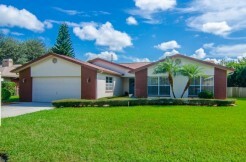 The architecture of Crescent Lake is an eclectic mix of early and mid-twentieth century styles. Early styles include Foursquare, Craftsman, Colonial Revival, Mediterranean Revival, Art Deco and Tudor. Eighth Street has a particularly fine collection of 1920s Tudor houses. Later styles include Minimal Traditional, Postwar and Ranch. Along the lake are some early Ranch-type houses dating from the late 1930s. Our buildings are diverse in form as well as style. The housing stock includes single-family homes, garage apartments and small multi-family structures. Businesses along 9th Street occupy large converted dwellings, helping this busy street retain the air of the grand residential boulevard that itonce was. The later development along 4th Street has left us with a lively collection of automobile-related commercial structures in the Art Deco style. A cypress dugout canoe dredged from Crescent Lake in 1924, provided evidence of a Native American presence in the neighborhood. The canoe, now in the Museum of History, is thought to date from about 1800. In the 1870s and 1880s, settlers of European origin arrived and put the land to agricultural use, chiefly citrus groves. This way of life did not last long. With the completion of a streetcar line out 9th Street to 34th Avenue in 1914, the groves became valuable suburban property and subdividing began. The opening of Crescent Lake Park in 1927, heightened the neighborhood’s appeal. The park was the brainchild of master developer Perry Snell, who acquired and held the necessary parcels until the city was able to buy them. Shortly after the park opened, the city built a ballfield for the New York Yankees at the south end, ensuring that national sports figures like Babe Ruth, Lou Gerhig and Joe DiMaggio would join a long list of local business and civic leaders who have been our neighbors. In 1990, the association began to write a neighborhood plan. A city grant purchased technical support from the University of South Florida, and City Council adopted the completed plan in 1995. The Crescent Lake Neighborhood Plan was first neighborhood-initiated adopted plan. Major projects such as entryway improvements and enhancement, landscaping, a fountain and observation decks at the lake, park expansion, and meeting hall remodeling are outlined in the neighborhood plan. The association’s calendar is always crowded. 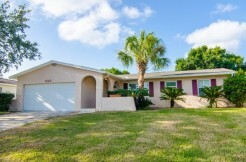 Besides producing and hand-delivering newsletters to 750 households each month, we hold a garage sale, lake cleanup, Spring picnic, Octoberfest, annual holiday party, and participate in such events and organization as CONA, Paint St. Pete Proud, Crime Watch, Adopt-A-Family, and the Parade of Neighborhoods. The Neighborhood Partnership Grant Program has been instrumental in improving the neighborhood. Our first grant enabled us to produce a color marketing and informational brochure. A second grant, along with monies from Mercantile Bank, allowed us to hire USF’s Center for Community Design for technical support in writing our neighborhood plan. A project identified during the planning process, landscaping a broad median on 17th Avenue North, was completed with a third grant while the plan was in the final stages of preparation. The grants have been matched by hundreds of hours of volunteer labor.